Drying salt (or Silica Gel) come in granules in a packet. The packets can be easily cut if needed to empty out a few grains of salt to make the packet fit inside the camera. The packet then needs to be taped shut again. 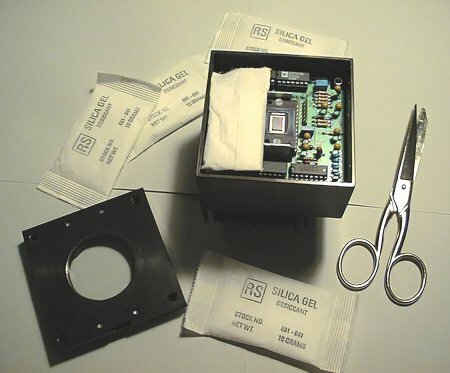 Silica Gel packets inside the camera guard very effectively against frost build-up in the CCD if you use the camera in very damp ambient air. Drying salt does not keep its humidity absorption properties for long. It needs to be regularly regenerated. To do so, heat it to over 120°C for approximately five minutes in a preheated oven (thermostat 4 or 5, oven door ajar). Another faster solution is to use a microwave oven on medium for 2 to 3 minutes. However, be careful, this solution is so effective that if you heat the grains too much, they may stick together! Never turn a microwave oven on with only Silica Gel inside. Silica Gel is available from photo equipment dealers. Try to find Silica Gel with a color additive that will inform you when it needs to be regenerated (drying salt is operational if it is blue; it turns pink if it is full of humidity. 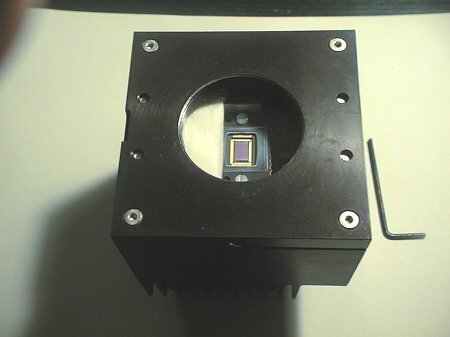 Silica Gel will keep its properties longer if you improve the camera's waterproofing (connectors inside the camera body and generally speaking the openings should be treated with a silicone glue seal, easy to remove if needed). Before closing the camer Here, the camera is shut with a packet of drying salts inside (to increase the effectiveness, you can also put two in, on opposite sides of the CCD.). This works for several days without any need for regenerating the packet. If the CCD window is kept clean, fewer ice crystals will form on its surface. Don't hesitate to open the camera from time to time to clean the CCD window. To do so, rub it gently with cotton after having blown lightly onto the glass.